By Gwen Higgins, Blueberry Creek Crafts. This basic slipper boot is a perfect canvas for embellishment with your own stylistic elements. Try buttons, straps, or tassels. It’s worked from the toe up similar to a sock, so you can adjust the length of each section to custom-fit to your feet. Make the boot as tall as you like. Two balls of Boutique Midnight is just enough to make 12″ tall boots, so you’ll need more yarn if you want taller boots. The pattern is written using standard U.S. terms. 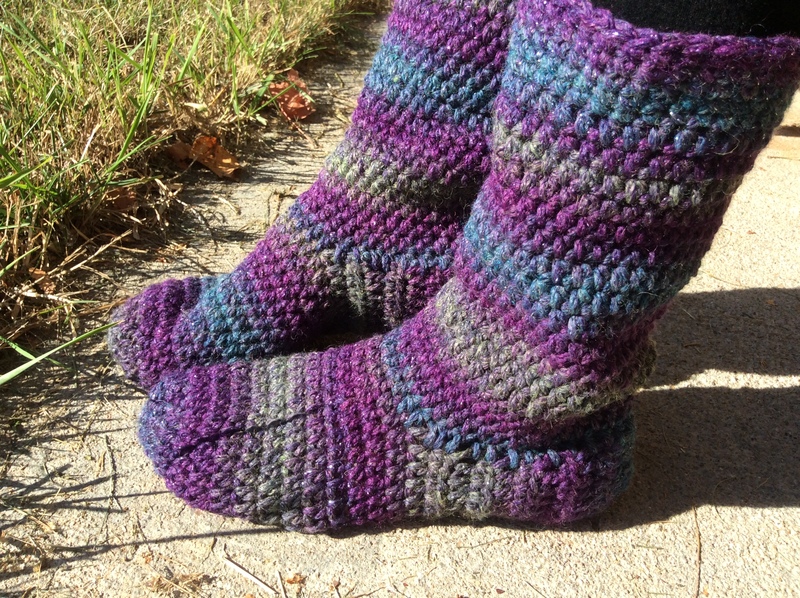 Update December 29, 2014: now includes other sizes, alternate yarn suggestions, and instructions for an improved heel. For pattern inquiries or comments, email Gwen at gwen.higgins@outlook.com. Materials: For sparkly slippers: Red Heart Boutique Midnight, two 70g (2.5 oz) / 140 m (153 yd) balls, medium (4) weight yarn, crochet hook size 6.0 mm (U.S. 10 / J). Substitute any medium-weight yarn that gives you the same gauge. Just make a test swatch. Other suggested yarns: Red Heart With Love (one to two skeins), Willow Burrow Worsted (two balls), Patons Décor (two balls). After making many pairs, I suggest using one of the alternate yarns. While the Boutique Midnight is very pretty and gives good results, it is not as easy-care, stretches out more, and may not wear as well as the others over time. Gauge: 13 hdc and 9 rows makes 4” x 4” (10 cm x 10 cm). In single crochet, 14 sc and 16 rows makes 4” x 4” (10 cm x 10 cm). Check your gauge and use a different hook size, if needed, to achieve this gauge. You may want to use a smaller hook if your feet are smaller. The boots shown are slightly large for me (I made them for someone with bigger feet), so if your feet are smaller than size 8, use a 5.5mm hook to tighten up the gauge and reduce the boot size. This pattern is written with ½” negative ease – that means, the finished slipper will be slightly smaller than the actual foot sizes shown, to allow for stretch. Sizes: Ladies U.S. shoe sizes Small (up to size 6), Medium (up to size 9), and Large (up to size 12). Instructions are written for smallest size with larger sizes in brackets. Boot height: Approximately 12″ total; 9″ shaft from top of heel, or height of your choice. Foot to ankle is 3.25″ (3.75″, 4.25″). Round 1: 7 hdc in 1st ch, sl st to join.Ch 1. Round 3: *1 hdc in 1st hdc, 2 hdc in next hdc; repeat from * 6 times. Join with sl st. (21 hdc.) For size small, your toe is finished. Continue to Foot portion. For sizes Medium and Large, complete round 4. Sizes M & L only: Round 4: Ch 1 * 1 hdc in 1st two hdc, 2 hdc in next hdc; repeat from * 6 times. Join with sl st to first hdc. 28 hdc. Work 1 hdc in each hdc around and join with sl st to first hdc. Ch 1 to start the next round. Continue in this manner until the piece measures 4.25” (5.0”, 5.5”) long from the beginning. This is approximately 10 rows (11 rows, 12 rows) in total from the start of the toe. Decision point: If you need a smaller or larger slipper, this is about the halfway point in the length of the foot. Work fewer or more rows as required to achieve the desired length. From here on, you will work in rows (back and forth) instead of in the round. Do not join at the end of each row; ch 1 and turn your work. The following rows for the back of the foot and heel are worked back and forth in rows, to make the back of the foot and the heel. Instructions for an alternate, more durable, heel are included on the next page. Continue working in hdc in rows until foot measures 8.5” (9.5”, 10.5”) from toe. Turn heel inside out and use slip stitches to join the back heel seam. Fasten off. Go to boot shaft. This method produces a more durable and shaped heel. It’s worked in single crochet with decreases at the back of the heel to provide a better fit. Next row: 1 sc in each sc. Ch 1, turn. Continue in this manner until foot measures 8” (9”, 10”) from toe. Join heel seam: Turn heel inside out and slip stitch both sides together. This creates the vertical seam at the back of the heel. Fasten off and weave in ends. The boot shaft is made by working rounds of hdc (or the stitch pattern of your choice) around the top edge of the rows that form the ankle opening. In general, on the first round make 3 hdc stitches for every two rows, or one hdc for every one row if you made the alternate heel. This will give evenly-spaced stitches around. I sometimes use single crochet for the first round to give a neater look. It’s your choice. Join again just to left side of heel seam with slip stitch. Ch 2. Round 1: Work 15 (16, 17) hdc evenly along left side, 2 hdc in centre front, and 15 (16, 17) hdc along other side. Join. There are now 32 (34, 36) hdc in the round. Join with a slip stitch to first hdc. Round 2: Ch 2, hdc in same stitch and one hdc in each hdc around. The chains at the beginning of each round are not counted as stitches. Rounds 3 through 18: Work as for round 2 (one hdc in each hdc) or until desired height (18 rows or your choice). Total height pictured including heel is approximately 12″. Ch 1. Last 5 rows: One sc in each sc around, join to first sc with sl st. Ch 1 to start next round, except on last round. Leave a comment with a link to your own version of these boots! Feel free to use this pattern to make items for sale, but please give credit to this pattern & my site. For more patterns and gift ideas, visit www.blueberrycreekcrafts.com. Happy crafting! Thank you for this pattern, I think it will be prefect for the whole family…I think the largest size will even work for the men in my life! I appreciate your sharing it!